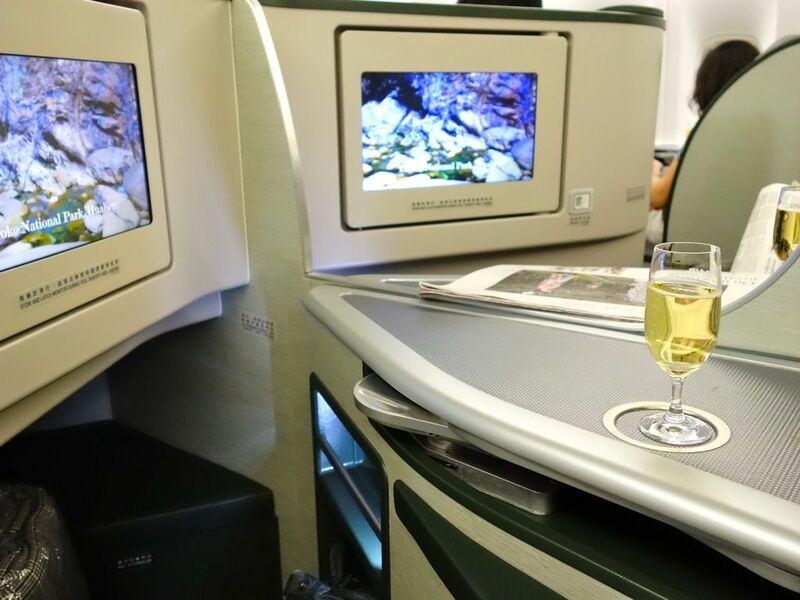 As promised, here's an update on the long haul flight on EVA Air's Royal Laurel Class from Taipei to New York City. 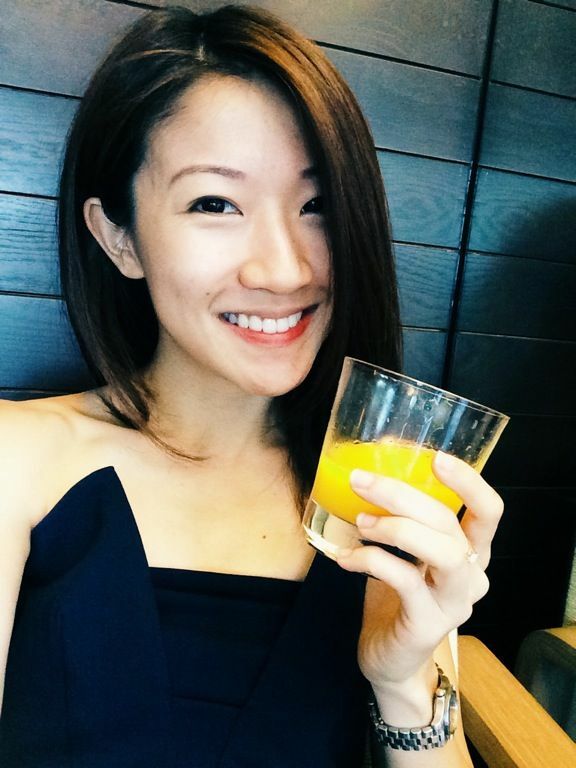 We took the Business Class flight from Singapore to Taipei (thankfully EVA used the Royal Laurel product) and it was rather empty. That wasn't the case from Taipei to New York on the Royal Laurel Class as it was packed mostly with Taiwanese businessmen. Needless to say, the flight was rather entertaining and the passengers boisterous. We started with some Dom Pérignon Vintage 2004, only served on the Royal Laurel Class. This is another mark of the premium business product as this champagne is typically reserved for first class. I was also glad to see my favorite FIJIWater available on board to hydrate passengers on the flight! Lovely touches. Whee. 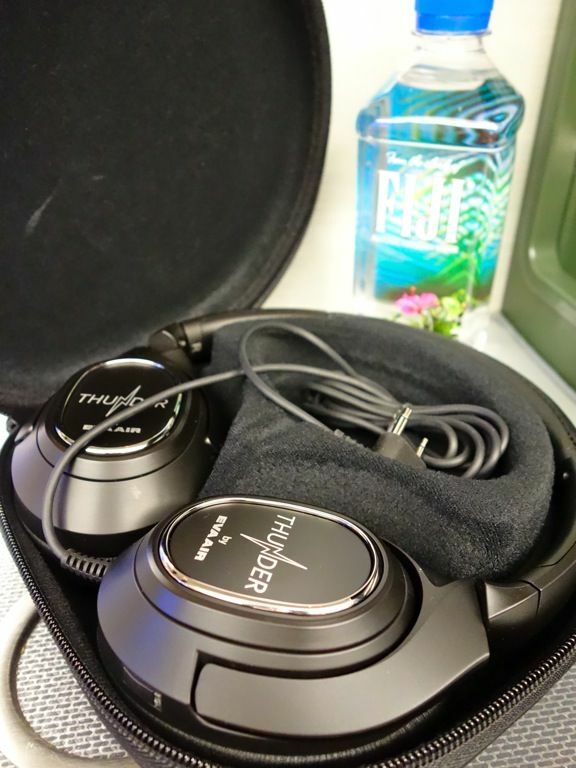 The noise canceling headphones in the Royal Laurel Class cabin are newly developed by EVA Air. With a soft ear padding and ergonomically designed headband, i found it comfortable enough to fall asleep with the headphones on. A convenient mute function allows you to talk to other people without needing to remove your headphones. It's no BOSE but it's better than nothing. For the long haul, i appreciated that the remote, other than the HD TV screen, is a touch screen. The bigger touch screen remote was perfect for watching movies in bed as the affixed TV doesn't tilt. It also allowed for multi-tasking as it has a split screen function. 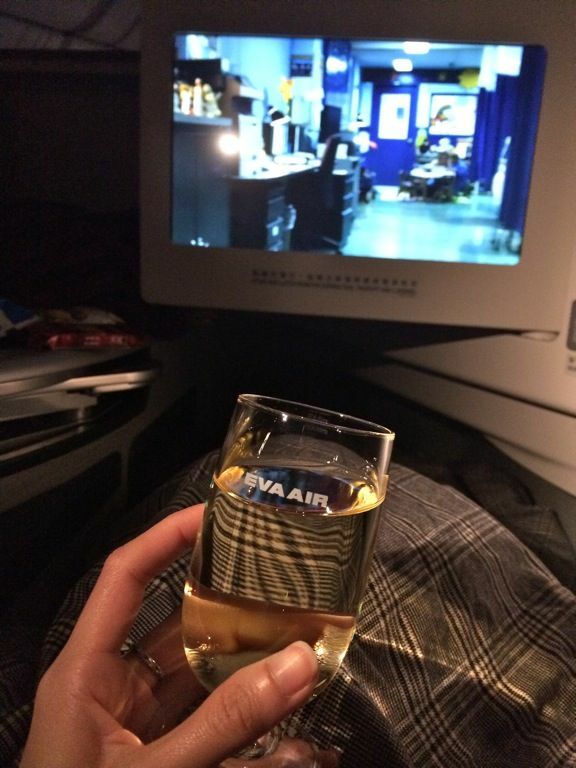 Another first class touch is the pajamas in the Royal Laurel Class cabin. The two-piece sleepwear set is made from a warm, soft, brown fabric. S actually found it too warm in fact. As for me, well the PJs isn't of the most flattering size (smallest is M), cut, or color and so i gave it a miss. I wouldn't blame you if you aren't interested in the PJs because well, let's face it, the Rimowa overnight amenity kit took all that focus away. 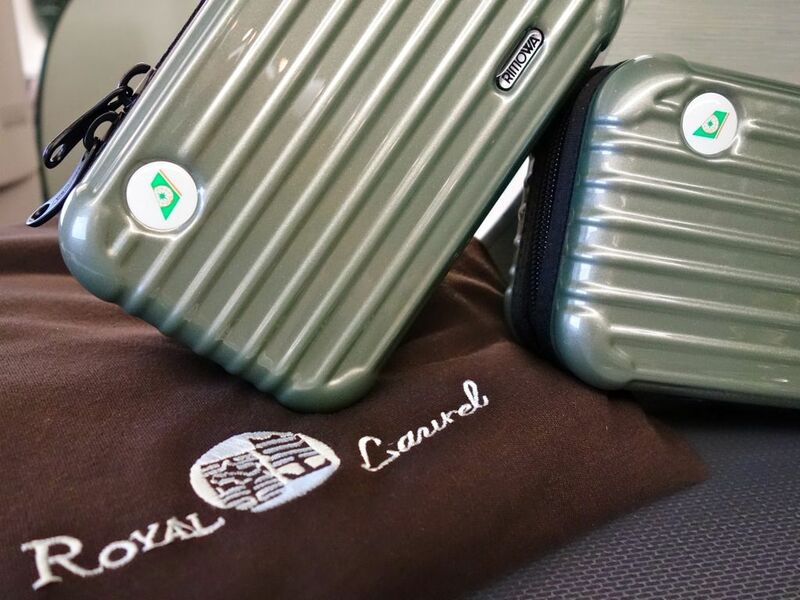 We were more than happy to add the EVA Air mini Rimowa to our current collection of ANA and TG kits.Rimowa kits come in crystal green and prosecco. The cases are made from the same premium materials used in the Rimowa luggage products. We received the kits in both colors during our departure and return flights. 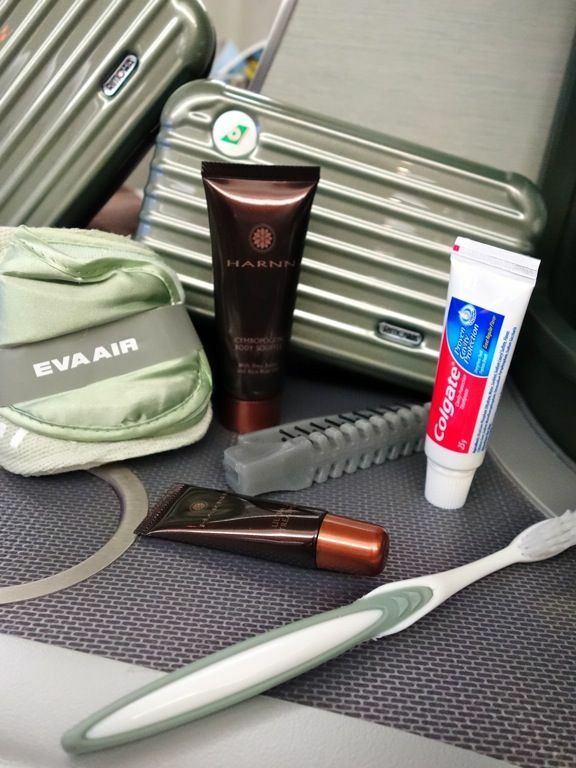 The contents of the Rimowa overnight kits have also been upgraded to now include lotion and lip balm from Harnn, Thailand’s top spa and skincare brand; a screen cleansing cloth for mobile devices; a satin sleeping mask; sleeping socks; toothpaste; a toothbrush; and a comb. Well, i brought my own essentials on board too- Derma-RX skincare products MAX C and Hydrator to keep my skin supple on the flight. Cabin air can be so harsh on the skin. On to the food on the long haul. 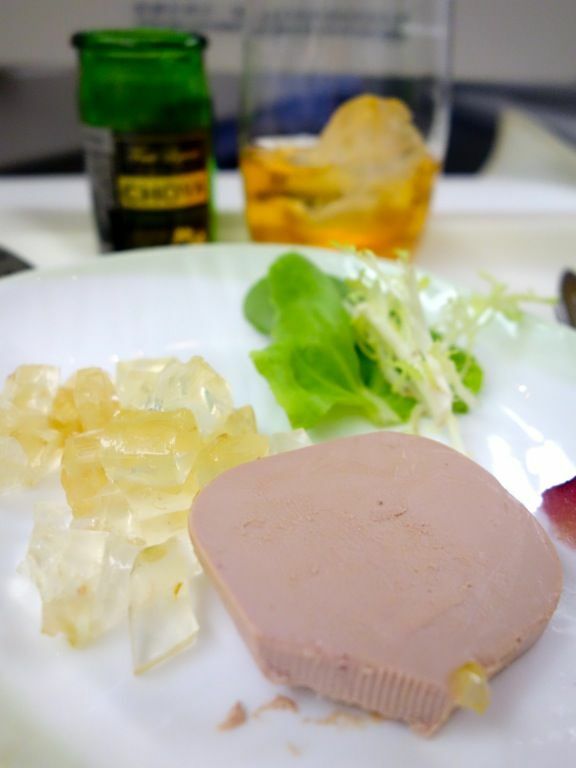 Appetizer of Goose Liver Terrine with grape champagne jelly and poached red wine baby pear. Nothing spectacular and the presentation was simply awful. 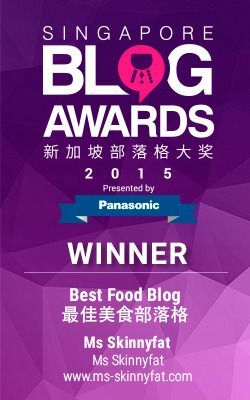 The plus is that EVA Air provides Echire Butter with their assorted bread. Yums! 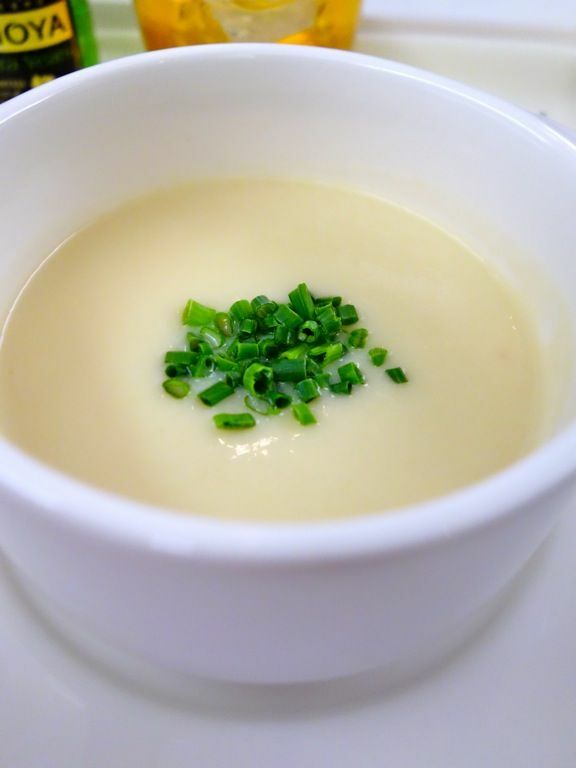 A creamy Apple and White Turnip Soup. I've never had such a combination and it was more fusion that western. S went with the Asian main dish- Braised Pork Spare Ribs Wu Shi Style with Egg Fried Rice. It looked really blah and the portion wasn't big. I went for the Pan fried Cod Fillet with Superior Crab Roe Egg White sauce as i thought that the Prime Beef Fillet would be overdone (as many highlighted online). Sadly, this sucked pretty badly. The noodles were soggy and lumpy and also very bland. The crab roe egg white sauce was curdy, probably due to the cornflower starch that they added to make the gravy. 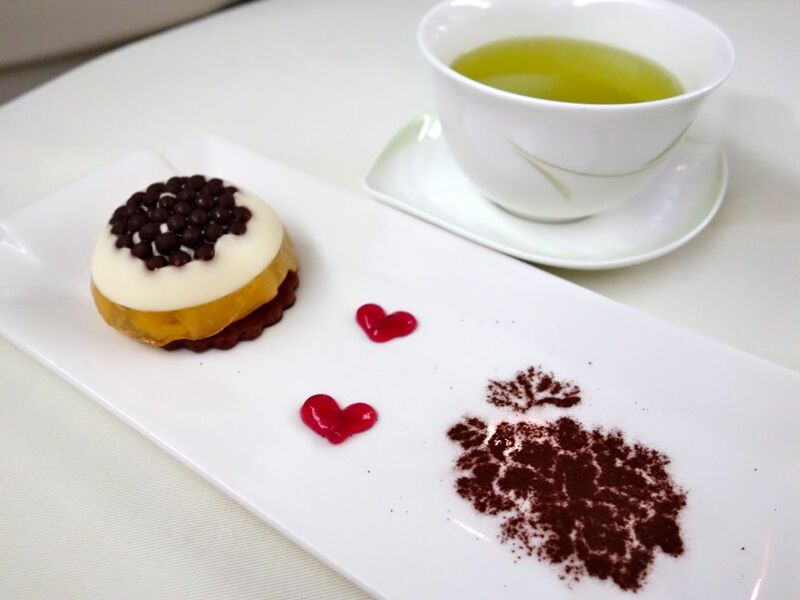 The Pearl Chocolate Yogurt mousse on a glazed pineapple tart wasn't spectacular as well due to the cloying sweetness. The best part of the meal was the garlic and blue cheese course that came at the very end. 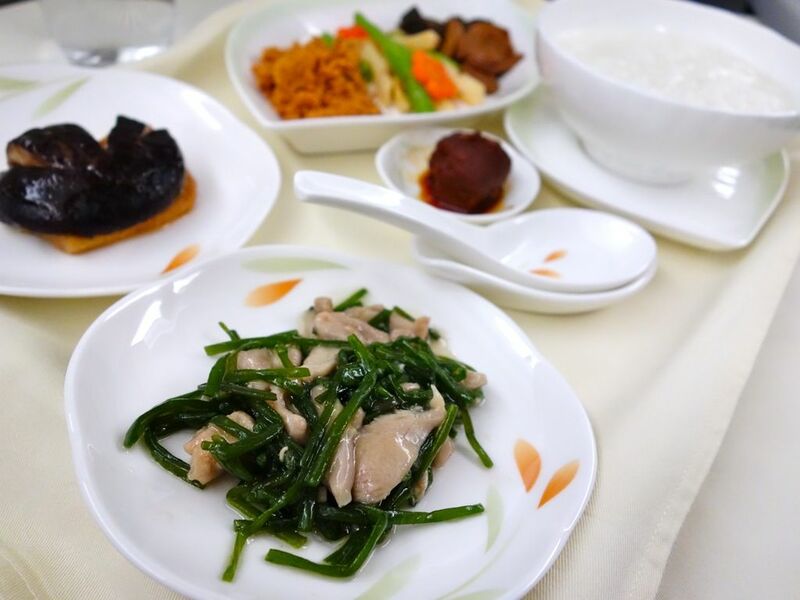 I couldn't believe how bad the Western meals on EVA Air were until i experienced it for myself. 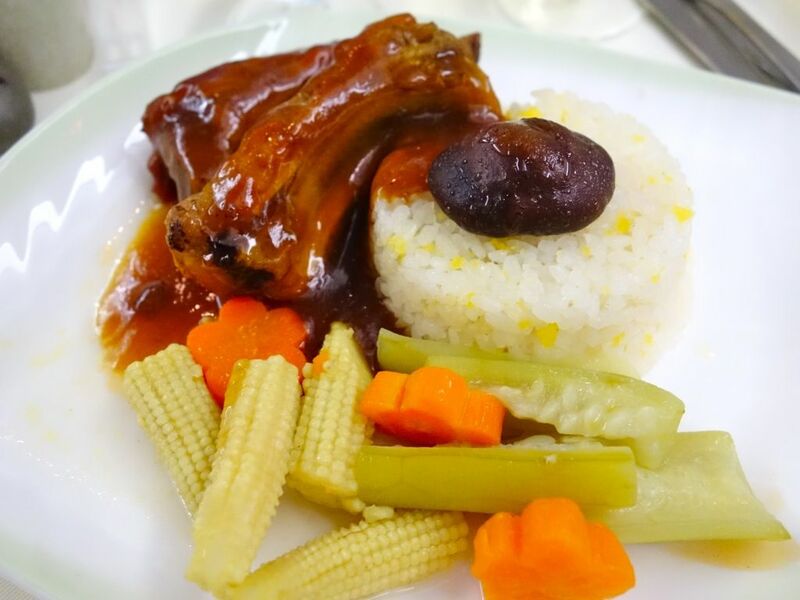 The horrible experience made me think twice about picking any more Western meals. The western choice for breakfast was sauteed seafood with pesto cream and potato gnocchi. Like seriously what were they thinking? S and I decided that the Taiwanese porridge option may be our safest bet. It was a way better alternative in fact. Silky porridge (not quite Cantonese style congee or the grainy Teochew rice porridge sort) was accompanied by the Wok Fried Shredded Chicken with Green Sprout, and Braised Shiitake Mushroom with Egg Tofu. 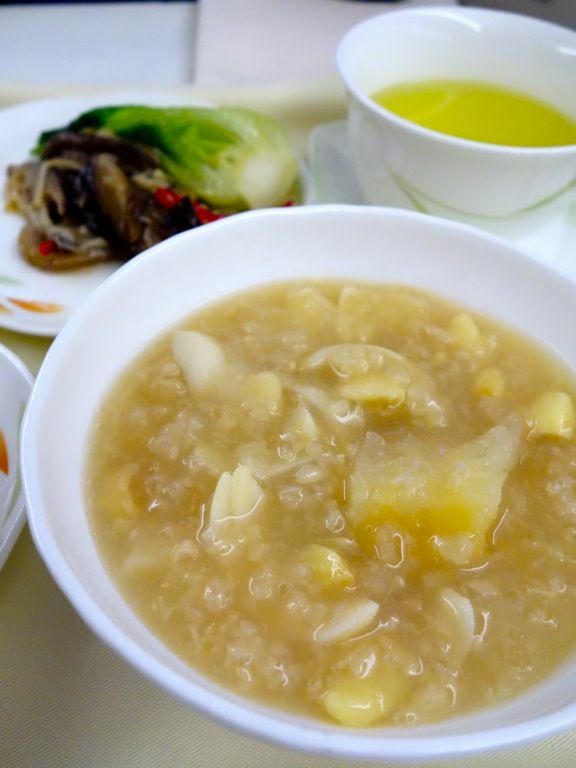 The porridge set was not spectacular but they were simply, hearty, home cooked dishes that we Asian Chinese are used to. The best part was the miso paste which i added to everything. 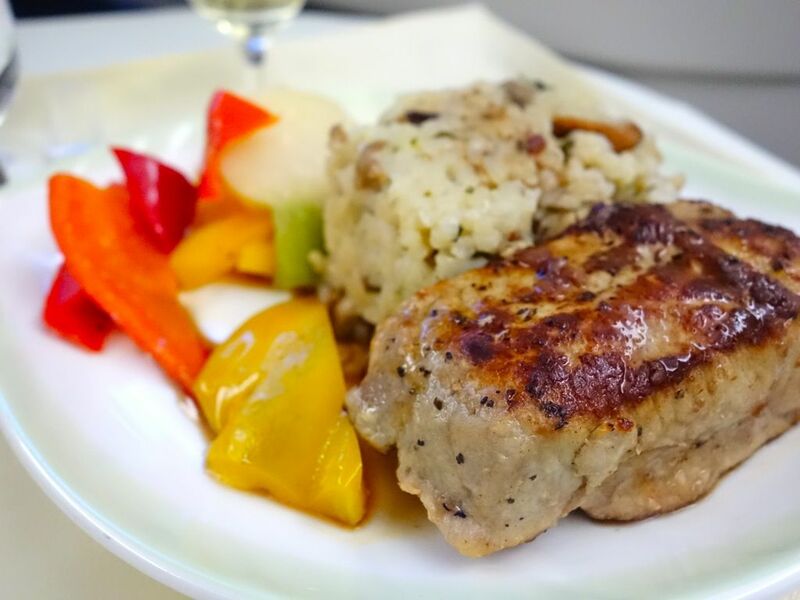 For the NYC-TPE leg, we played it smart by pre-booking our meals. The selection still sucked nevertheless. The Lobster with Mango Salsa was on the rubbery end. 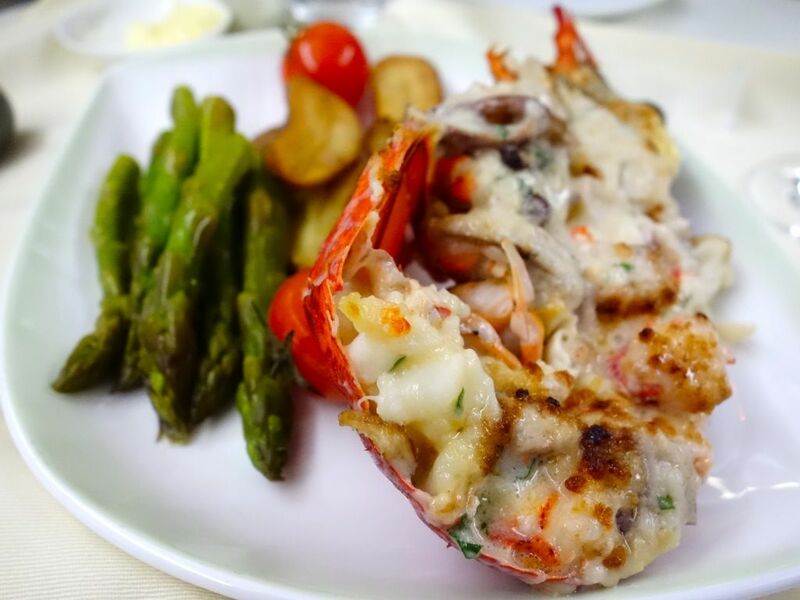 The Lobster Thermidor was sufficiently creamy and moist. Skip the tough Pork medallion with mushroom risotto. You should never order pork as it can be very dry in the air. The soggy rice was also too salty. Desserts was a caramel almond cheesecake which was decent enough. The limited on board menu for dinner/supper at 1am. BOO. 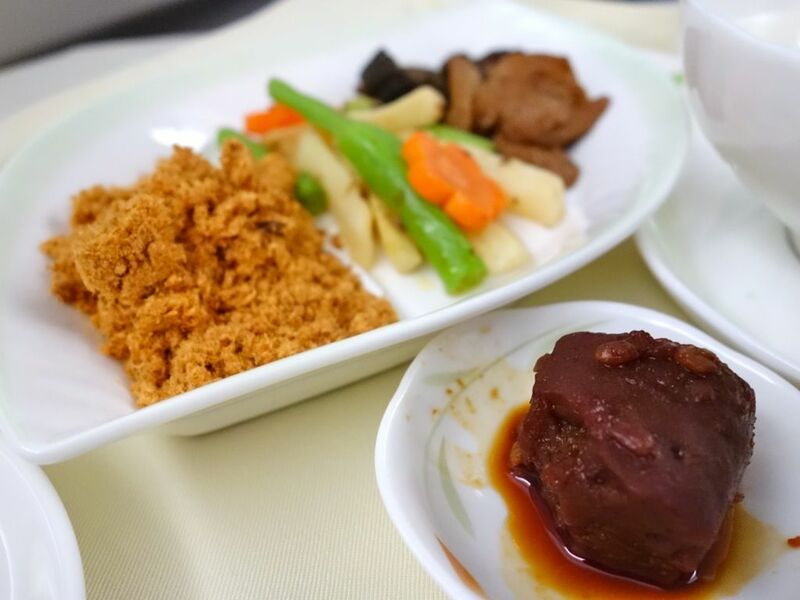 This food by EVA Air is really disappointing. For supper, we tried the noodle soup with minced pork, fish ball, fish cake and preserved vegetables. This is typical Asian comfort food. 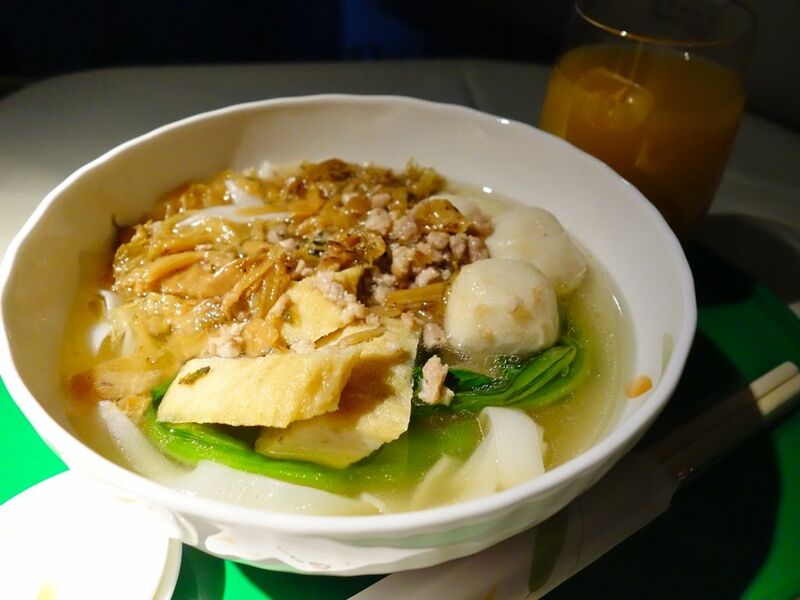 The hor fun (flat rice noodles) didn't quite survive the plane ride though and became quite cakey. The fish balls also weren't very fresh or bouncy. 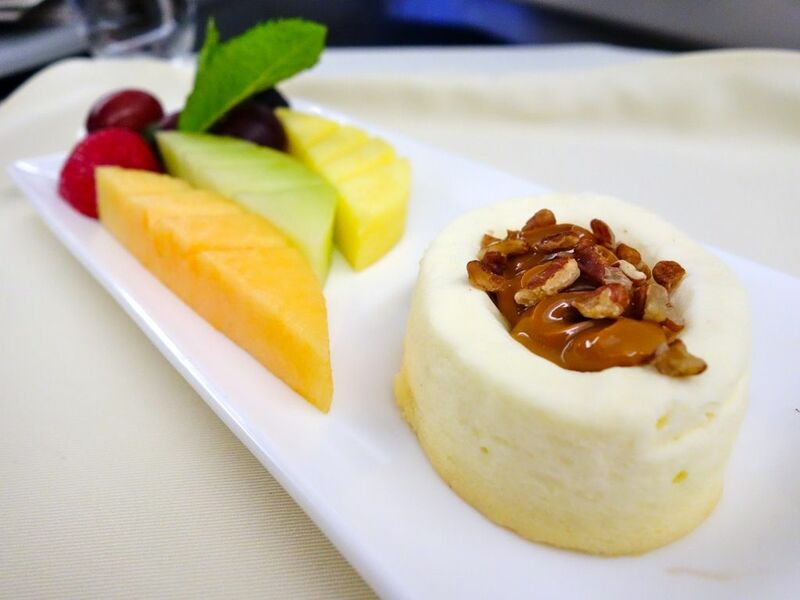 Other than the disappointing food selection and quality, we weren't very pleased with the lukewarm service that we experienced on our various EVA flights. 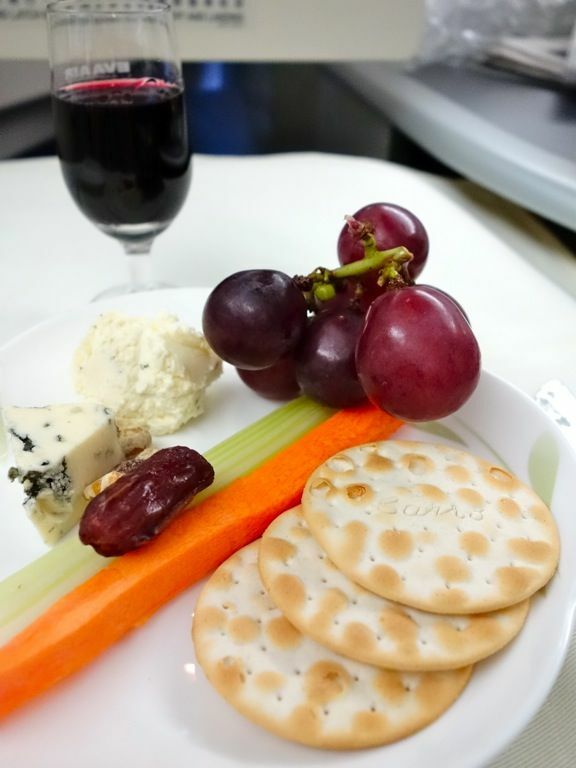 Unlike the SQ flights where we were constantly being offered snacks and drinks, i even had to hunt down the EVA Air stewardesses and stewards to get my movie snack. What i didn't get was the look of bewilderment when i asked them for their selection of bites (i also caught the judgy look)! The snacks were all packaged and processed, which added to my disappointment. 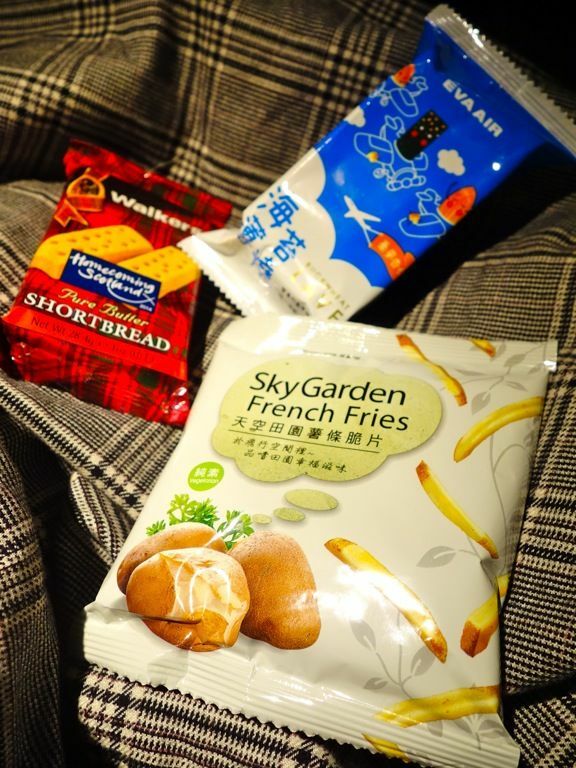 The french fries were similar to the famous Hokkaido Potato Farm version and the seaweed snack was recommended by the stewardess after she finally acceded to my nibble request. Well well, at least i've Dom for company. Me all tucked into my flat bed with the really fluffy comforter. For breakfast, i opted for the Royal Laurel Special, which has the interesting Braised pork in Shao Bing. 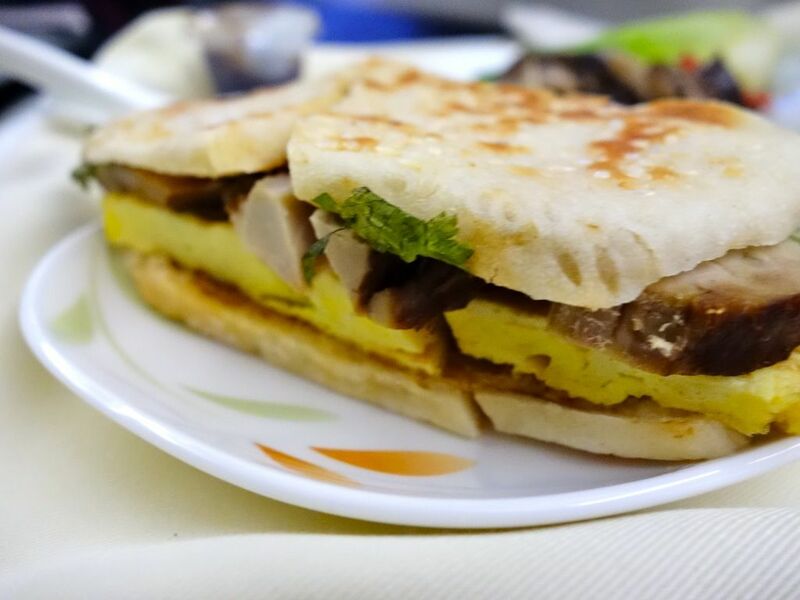 Shao Bing is a scallion pan cake and is commonly found in Taiwan night markets. The pan cake/bread was fragrant and fluffy. It's not as fresh or piping hot as the night market ones but it was fairly decent for a flight meal. The pork was on the dry side as usual but i was quite happy just having the omelette and scallion pancake. 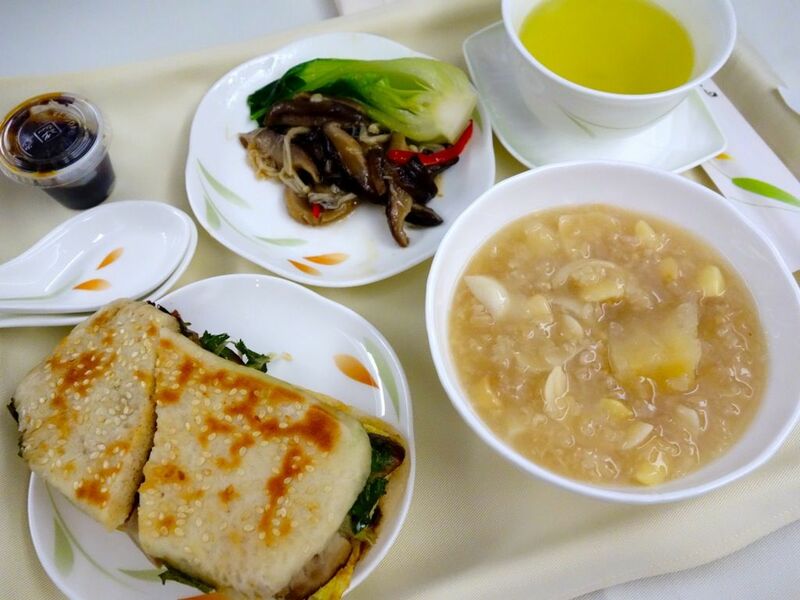 Instead of plain porridge, a lily lotus seed porridge was served and it had an amazing light sweetness to it. Add some miso for an added umami! was really comforting and sweet. 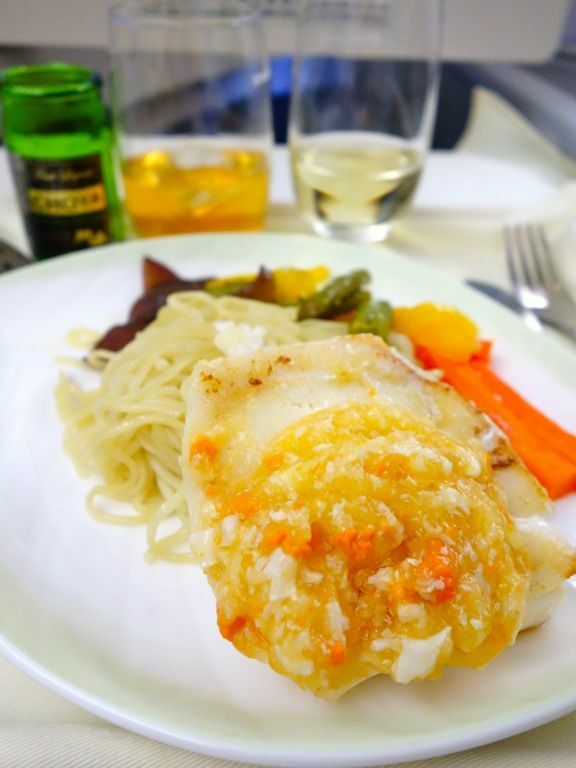 It was obvious that EVA Air doesn't fare too well against Singapore Airlines in their category of Business class product. 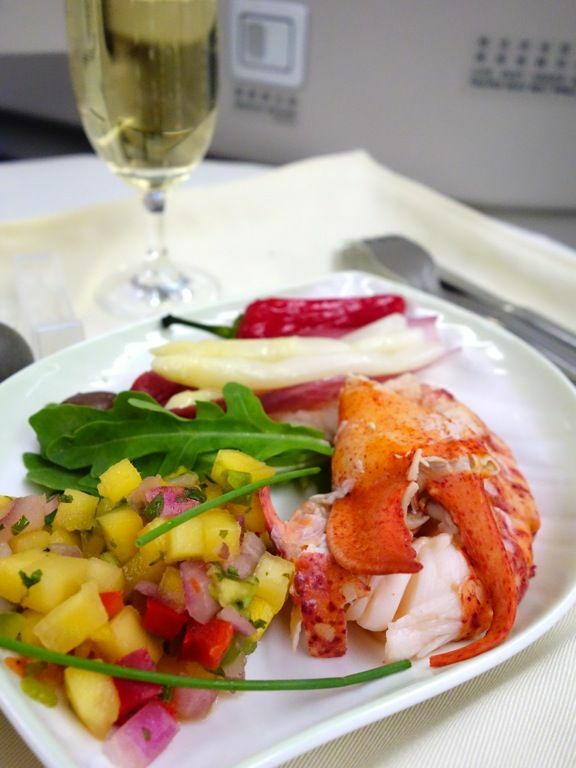 I appreciated the hard product but business class is more than just the seat, or entertainment. 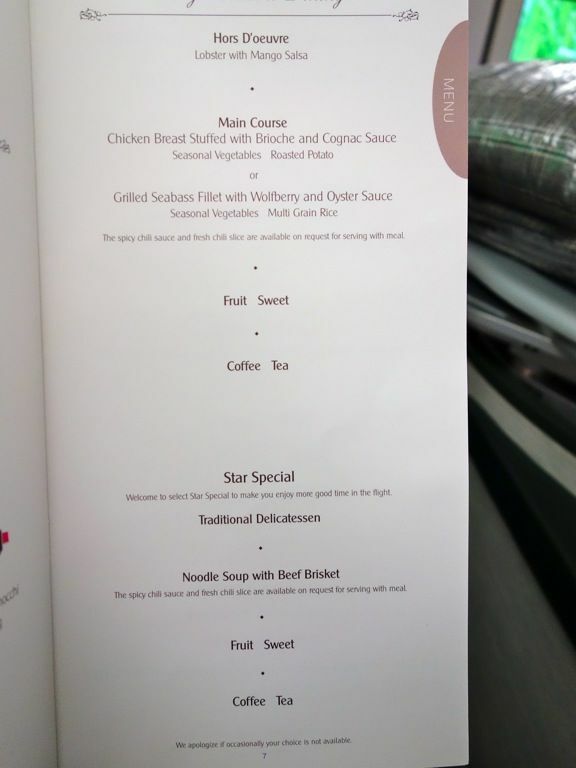 In order to have an edge, i believe EVA Air has much to work on their in flight menu (the food is horrendous and the selection limited) and their lukewarm service in order to appeal to international travelers.